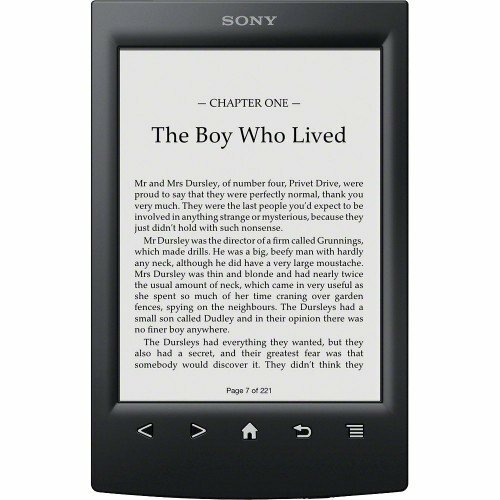 I bought this little reader used on Amazon for a great price. It has a few drawbacks but overall I am pleased with it. I wrote an article earlier about my disastrous experience with the LookBook reader. I'm pleased to say I finally found a little reader that fit my budget and does what it is supposed to do. 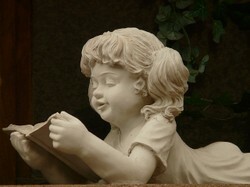 I stumbled across this little reader as a used item for a great price. It was unbelievably affordable so I sprung for it. It was shipped very fast and I couldn't wait to try it out. You couldn't tell by looking that it was used. The leather case it is attached to looked brand new and I didn't find any marks or scratches anywhere. I think it came charged but I plugged it in with the new charger that was provided. I connected to my computer with the USB cord and it installed the software automatically Then I tried to move some books from my computer to the reader. They came right up and I could read them. How easy was that? The problem came when I tried to get books from the public library. These are protected with a feature known as DRM. By registering with Adobe Digital Editions, I can download the books and ADE will unlock them. It took several hours to figure out exactly how to do this. I chatted with our local librarian who didn't have a clue what I was talking about. Finally I managed to get a couple of library books on the reader that were unlocked and was delighted to be able to curl up in bed and read to my heart's content. A couple of days later I tried again to take some books out and again had a bit of a problem. I think it's just going to be a slight learning curve. There is supposed to be a way to books stored on Amazon's Cloud Player to download to an eReader. I have yet to figure out how to do that. It might not be possible with this reader. That will take more time to figure out. There are some things I would improve on this little reader. For one I was surprised that there was no back light. I felt it would be easier on the eyes to have that but I haven't really had any trouble getting light on the reader, just like a real book. The button for the page turner is like the circular button on a cell phone. It's easy to hit in the wrong place and go the wrong direction. Even the LookBook had a button near the edge of the reader that was easy to hit with just a flick of the thumb. The reader doesn't reformat the pages so there are strange breaks in mid-paragraph and even mid-sentence in some books. Others are perfectly fine. The reader is very small so you have to turn pages frequently. The plus side of this is that it is a very portable reader and fits neatly in a small bag or large pocket. All things considered, I probably would have gone for a model with more features if I had had the money. As it was, this was about the only model I could afford so it was this or nothing. This reader is listed as between $200 and $250. Amazon has new ones at $50 and used as low as $20. I am thrilled to be able to read a book or check something out of the library any time I want. 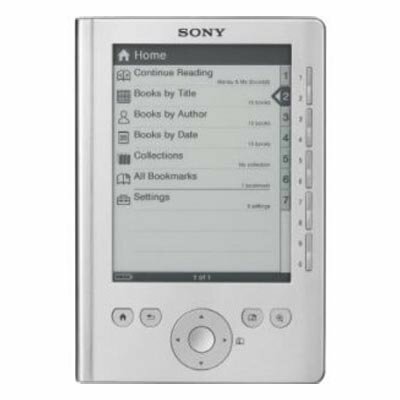 I love my little Sony reader. Now that I've had my reader for a while I thought I'd give an update. I still absolutely love it. I still would have had a fancier model if I had the money, but every time I close the sturdy leather cover and shut it down, I am grateful to have it. I love the ability to visit the library online any time I want and find great books to read. I discovered that our local library, which is what I go through to access the books, has an automatic expiration on the books I check out. That means I don't have to worry about getting them back on time. I can just remove them once they have expired. I only have to watch it for large books that may take a bit longer to read. I haven't tried renewing ebooks online yet. Since this is my very first experience with a reader, I didn't realize that I could only buy books from Sony. I can not get any books from Amazon or any other seller. 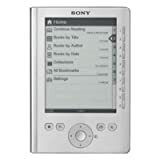 That was a little disappointing but Sony has a wide variety of books, if not as many as Amazon, including free and for 99 cents, Since I have so many books yet to read for free from the library, I won't be buying too many books yet. I did download a free book with a knitting pattern. I was disappointed with the quality of the photos since the reader screen is small and black and white. Then I realized I can look at the photos in color through the reader program on my computer. Nothing lost. I do love the portability of this small reader. It fits neatly in my pocketbook and I can carry more books than I could possibly read in one slim package. What is Your Favorite Reader? As far as I know I can. I plan on using the library mostly since my budget is so limited. That's cool that you can watch movies! Wow. This is my first ereader so I'm just ecstatic that I can actually read on it. I have a Nook which I like. I've mostly watch Netflix on it. I'm sorry I didn't get a Kindle, because their books are cheaper than B&N. Can you download books from anywhere with your ereader? Those were the first I uploaded and they worked! Yippee! Wow, I'm happy for you, Lana! Remember the Gutenberg Project, where you can get loads of books for free! My experience with the LookBook eReader was not a happy one. Here's the sad story of what happened. 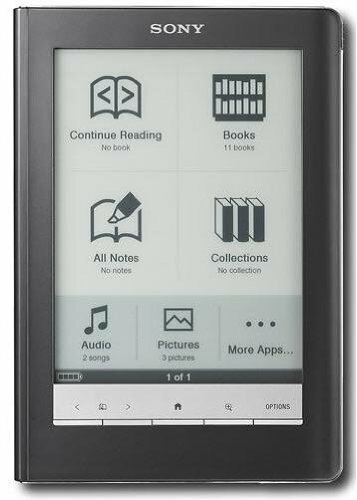 The Barnes and Noble Nook could rival the Amazon Kindle especially with their Nook Color. 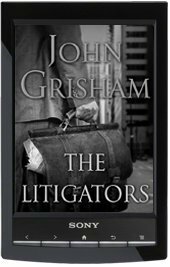 Is it a serious rival and would it be the best ebook reader for you?